The HIOKI 3554 Impedance Tester - What, How & Why? 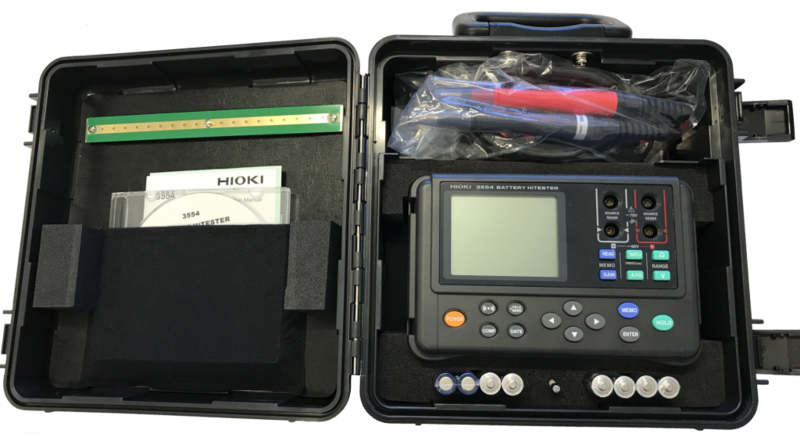 The Hioki 3554 is an impedance tester which measures the Battery Impedance in mohms (mΩ). Like all impedance meters, the Hioki 3554 has the ability to test batteries simultaneously. It can also test within live circuit and take accurate comparative readings for early diagnosis of a battery failure. How does the Hioki 3554 work? The Hioki 3554 measures the internal Battery Impedance. Battery Impedance is a combination of internal resistance and reactance, where internal resistance + reactance, or (L+C), equals impedance when using an AC stimulus. Why use a Hioki 3554? Repeated recharging of a secondary battery can lead to battery deterioration and increase its internal resistance. Problems can intensify when there is a short-circuit in the internal call leading to voltage drop, overheating and complete battery malfunction. Worst of all, these problems can cause life-threatening fires and other accidents. The Hioki 3554 allows for the batteries to be tested without discharging and recharging. The standard Pin Type leads with the single test pin on each lead has been fortified to withstand even the toughest use, while a new dual-axis mechanism incorporated in the new Pin Type lead allows the two pints in each test lead to move independently. Just encase of breakage, these pins are easily replaceable within both options on site. The hassle-free measurement process is extended to data management and processing using the bundled data management software. All 4800 sets sets of data can be uploaded effortlessly via a USB cable. It can also be displayed neatly in table format. Edit comparative tables and and send them back to the Hioki unit. What can you expect from the Hioki 3554? Enables measurement without shutting down the systems! Making it possible to shorten the time required for measurement. Obtain reliable measurement values unaffected by lead or connector resistance. Without changing functions, this instrument can display battery internal resistance, voltage and terminal temperatures simultaneously. Please note, temperature measurement does require the optional 9460 Clip Type lead with Temperature Sensor. Using the Hioki 3554's instrument comparator feature makes it possible to set threshold values for internal resistance and also voltage, enabling reliable measurement of battery wear. Get a complete diagnosis of batteries with a single device! Determine what a battery is like now, and what it will be like in the immediate future. Viewing the exponential graph, you can see when the battery is reaching the end of its life if the impedance starts to spike. Therefore, you can determine ahead of time when the battery is going to fail. Tips and Tricks for the Hioki 3554! Average Function - will handle fluctuating measurements, can measure batteries that are in banks without disconnecting them. Hold Button - allows you to take the leads off the battery when testing and make a note of the reading and it's still available. Less hassle and risk of losing a reading! Easy to carry case! Simple to take from site to site and can't ruin the tester. Tester is safe in the case meaning less risk of damage. Neck Strap - two hands free to control the probes making it easier to use out in the field when testing. Set up to take 12 readings and it will order and save those readings. When you finish, you can go back through the readings making them easy to take note of. Audible notification when the reading has been taken so you know when your reading has been completed without looking at the screen. Behind the cover is a spot to store replacement AA batteries to ensure that you are always ready to go! Want to learn more about the Hioki 3554?